In the southern part of Czech Republic is a town called Cesky Krumlov which, is considered as one of the most beautiful and unique medieval villages worldwide. From here the border with Austria is at hand. The whole town is built along the Vltava River, the part that passes through the picturesque and unique natural region of South Bohemia. From this the capital city Prague is located 170 km away. There are no disagreements that the biggest tourist attraction in town is the Castle Cesky Krumlov, which was erected on the west bank of the river Vltava. Built in the 13th century, today it impresses with its unique gothic architecture which after nearly three centuries later was refined by Renaissance motifs. Castle Cesky Krumlov is the second largest after Prague castle. Objectives is that it has 5 internal courtyards and a beautiful park. After a 16th -17th century the inside of the palace was reconstructed again but this time in the Baroque style. 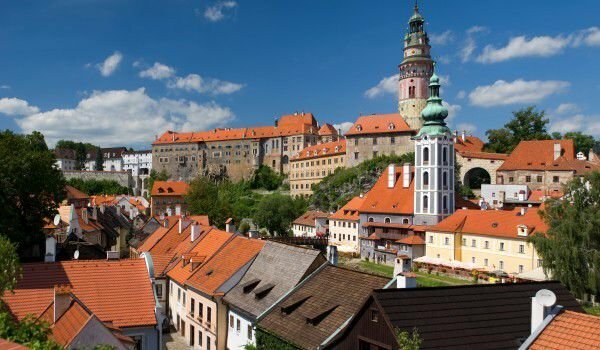 The atmosphere is completely preserved to this day, and thousands of tourists here are able to see the evidence of historic interest, which represents Cesky Krumlov castle. Situated opposite the old city center square, the castle can be reached by the so called Red Bridge. To go beyond its walls, you must pass over a moat in which real bears live. Decorated with Renaissance frescoes the tower can upload an extra charge, but in the halls of the castle there are great collections of Renaissance and baroque art. Renaissance windows and antique motifs that were current in these past centuries in antique columns, gods and heroes are unique. Painted bricks called sgraffito and decorated chambers of three aristocratic families who owned the castle over the centuries. In the 16th century comes to the large fashion of beautiful gardens, therefore almost every castle there had one. Cesky Krumlov park however, has a unique attraction, the preserved Baroque theater with a rotating floor. It was not only for moving themselves (actors), but also here the theater is moving. To visit here is really an incredible and amazing experience. The overall area and buildings of Cesky Krumlov are so extensive that travel agents organize three separate tours of different parts. Around the walls of the castle Cesky Krumlov the town itself was built, which is crowded with tourists from around the world.